I need to eat something light and cheap today. Tonight I’m seeing Behzod Abduraimov, a young up-and-coming Russian pianist perform at Carnegie Hall. Hubby and I are eating before the concert before I will join up with my friend, so lunch can be on-the-fly. Also, I need to try the goods at the other end of Falchi’s. Enough said. Situated across from Rice and Chopsticks, Rib in a Cup reminds me of those eateries in a food trailer, outside of a sport arena or a full parking lot at a park during Renaissance Faire weekend. I looked at the menu: Rib in a Cup, Mac & Cheese, Fried chicken in a cup, Mac & Cheese & Waffles (seriously? ), for around $3-4 bucks each, and some sides (I chose Cole slaw) for $1. Soda drinks/water was also $1. 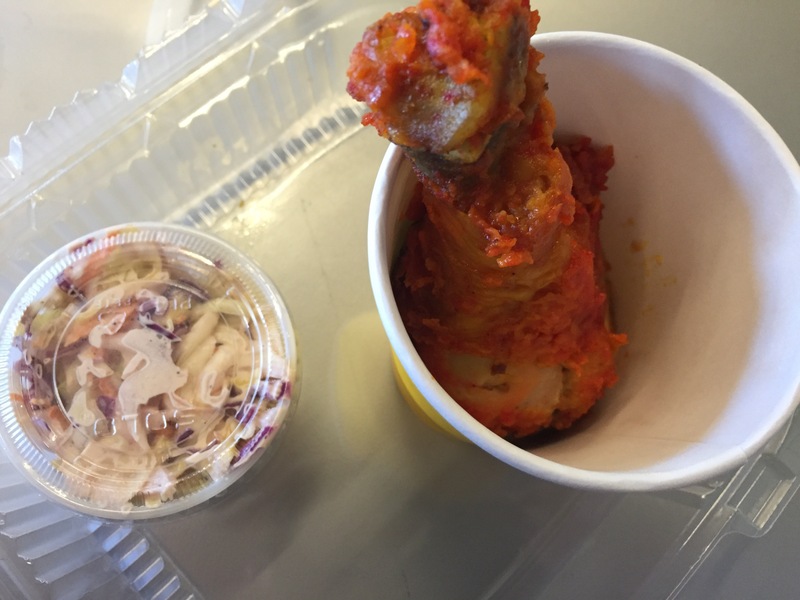 I had the only thing on the menu that wasn’t pork- or cheese-based: Fried chicken in a Cup. Total price: $5. Good news: The chicken leg was HUGE! And, the meat was juicy and tender. And sticky. Bad news: I don’t think it was actually fried chicken. Yes, it was rolled in bread crumbs, but it was cooked in a very bland tomato sauce. At first glance, I thought it would be buffalo-favored…but, no. (There were barbecue and honey sauces on hand, but I didn’t take any… I should had). However, the cole slaw was very nice; subtle, crunchy, a good palette cleanser. So, it was tasty, but not what I was expecting.